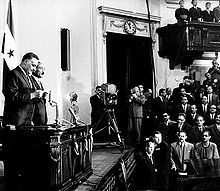 A presidential election was held in the United Arab Republic (now Egypt) on 15 March 1965. 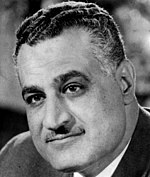 The election took the form of a referendum on the candidacy of Gamal Abdel Nasser, who ran unopposed. He won with almost seven million votes, and only 65 against. Voter turnout was 98.5%. This Egyptian elections-related article is a stub. You can help Wikipedia by expanding it. This page was last edited on 7 December 2018, at 21:47 (UTC).